2 channel mic amp/equaliser and mono compressor. Small and portable with above multi functions, making it also valuable for stage use. Rack available to accommodate 2 units, or perhaps a Freebird. Stepped / Indented gain controls. Large easy to read controls for all functions. Musical sounding eqs based on the award winning Rooster and Earlybird 2. Phase reverse switches on each mic. amp. Both mic. amps can be used individually and summed to the compressor. The 'Compressor' is based around the Phoenix but has a bit more 'bite. Great for Vocals, Drums etc.etc. All Valve signal path and side chain. A Standby Switch is provided to extend valve life. The Nightingale 2 is a 2 channel mic amp/equaliser and also a mono compressor, based around the now classic Phoenix design, with summing facilities included. The 2 preamplifiers with EQ and the compressor can all be used individually or may be combined in 3 different modes by using the summing section. This can be done whilst still taking un-combined outputs from each pre amp output This set of features and the superb quality valve sound make the Nightingale 2 a unit like no other that we know of. 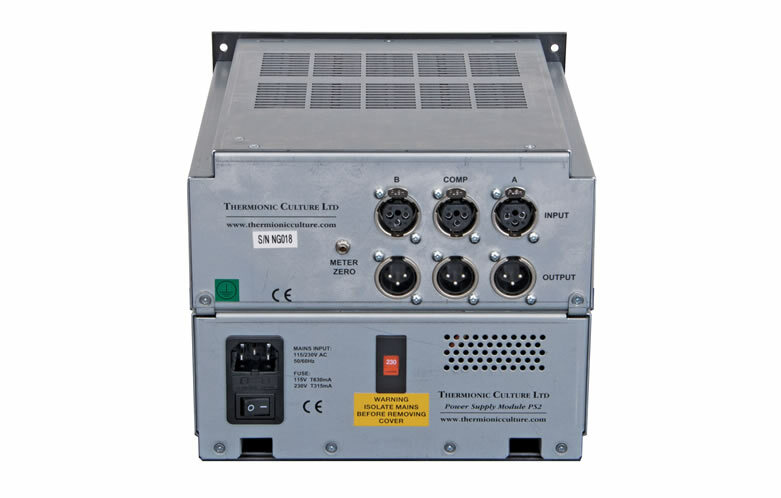 The unit comes in Thermionic Culture’s half rack design format and has a built-in but detachable power supply. 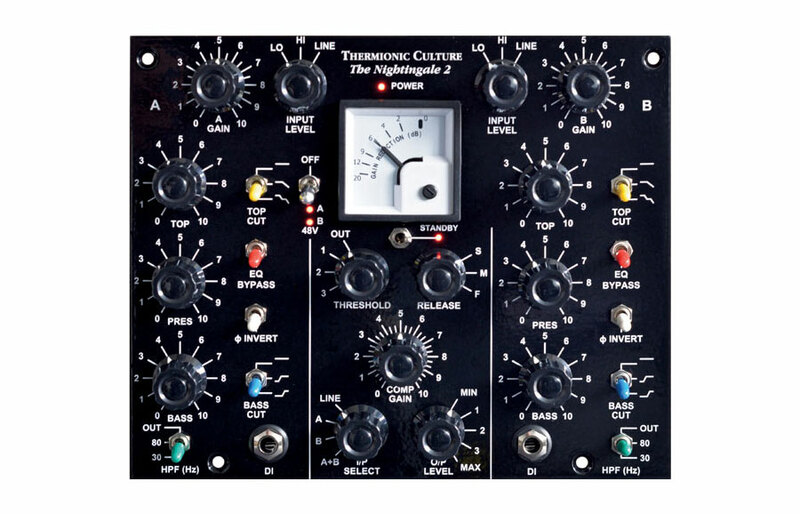 It will work normally as a standalone unit but if desired The Nightingale 2 can be put together in a Thermionic Culture 19 inch rack case with another Nightingale 2 to give stereo compression and 2 more eq./ mic. amps, or you can add a different Thermionic Culture half rack unit such as The Freebird 3 channel equaliser. The 2 preamplifiers (A and B) have switched input level controls which allow them to amplify mic or line level signals, or take DI signals that can be accessed from the ¼” jack inputs on the front panel. In each pre-amp there is an eq section based on the Varislope bass, top and presence controls found on the Earlybirds and Roosters. Filters/Cuts are provided for removing unwanted rumble, etc.and shaping curves. If the bass lift and cut are used together “Pultec” style, a mid cut will occur. The eq section can be totally bypassed with the Eq Bypass switch. There is a 48V switch to supply phantom power to both channel inputs, and a Phase Invert switch, very useful with drums, vocals, etc. The Compressor is based around the Phoenix compressor but has differences in valve choice and transformers to give a little more gain. 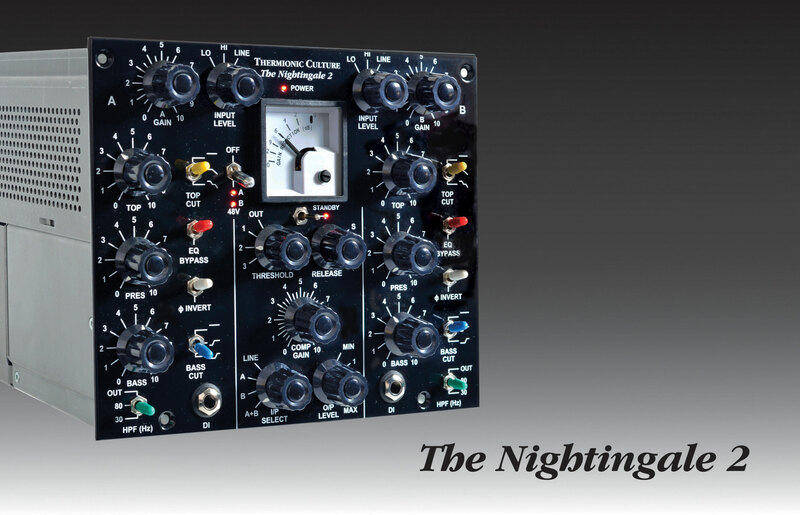 This gives the Nightingale compressor its own flavour with a bit more bite and attitude. Compression can be monitored by the miniature Phoenix style meter in the centre of the unit. Stepped and indented controls allow for easy recall-ability. This may come in very useful on a unit with so many possibilities in tracking, mixing and “live” use. The summing section of the Nightingale 2 allows the compressor input to be taken from it’s input ‘Line’ connector on the back of the unit, the output of preamp ‘A’, the output of preamp ‘B’ or a sum of both preamps ‘A+B’. This unique feature really allows the unit to be used in a huge variety of ways and to achieve some classic high quality valve sounds as well as some more unusual and creative effects, especially as the outputs from the preamps can still be taken separately to the mixing desk / DAW whilst being routed into the compressor section. The Standby switch is provided to extend valve life by reducing voltage. Use when switching on, or when not actually using the unit for a time. 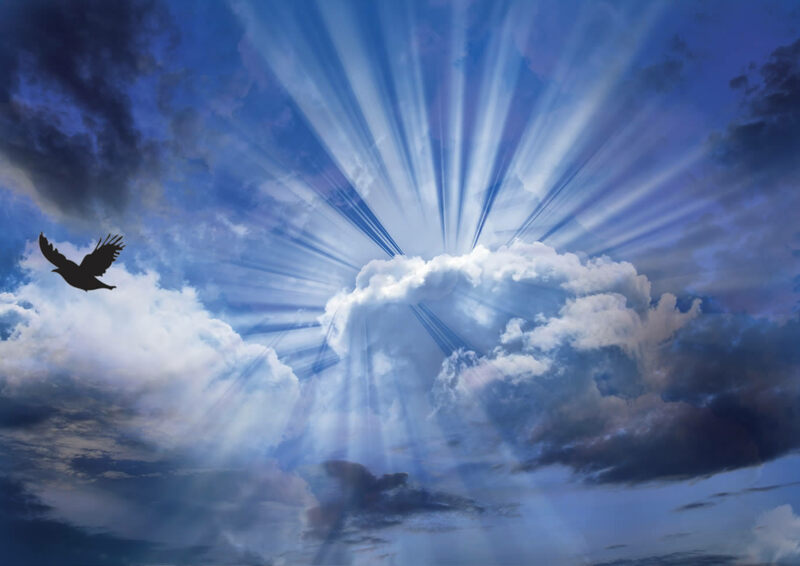 It will come back to full power instantly when needed. The Nightingale was originally designed for Live use, where 2 vocalists can be blended together through 1 compressor to give a really tight sound with better separation from the backing band, but, like our Culture Vulture, it has many other uses, most notably on drums where the phase reverse can achieve great snare sounds and of course when recording vocals.